In an age where everything is shared online via social media, there is an opportunity in NOT sharing. Or rather, in sharing selectively, with a small group. “Going viral” is what everyone seems to dream of, which means there is an opportunity in embracing intimacy. That showing one person, or a selected group, that you care, is a way to stand out, while everyone else is focusing only on the masses. I was listening to an interview with Damon Albarn about his headline gig at the 2009 Glastonbury Festival. He actually contacted the BBC to see if they WOULDN’T broadcast and record it. Even though he was playing to well more than 100,000 people, he wanted to have a moment that would be experienced ONLY by the people there, living in the moment. That, we are somehow robbed of private moments, or group experience, of living in the moment. His colleague Jamie Hewitt added that when you watch a performance at a show like that, the instant the band comes on, thousands of little blue screens pop up – cell phone cameras held aloft my fans. Even in the moment they waited for, as they are experiencing what will one day be scared memories, people are overwhelmed with the concern of CAPTURING the moment. Of storing it, filing it and sharing it for later experience. That people are so concerned with saving the memory, that they don’t actually experience the moment. How is this not merely an observation, but an opportunity? Many of us work in niche markets – and your businesses can be profitable and growing without needing everyone on the planet to buy from you. Sure, it’s nice to dream about having the kind of success that J.K. Rowling did, or that Jeff Bezos did, or that Steve Jobs did, but is it worth betting your entire future on the .0000000001% chance that it could happen to you? What’s wrong with merely being profitable? With merely being adored by your niche market? With a growth rate of 20% each year, instead of 700%? When you limit who you share things to, you create exclusivity. You enable shared experience. Why is it we feel a closer connection to those who went to the same elementary school we did – or the same fraternity – or who worked at a certain company or in the military? Shared experience. When you focus on only a select group, it increases the chance of individualized attention, and shows that you care about THEM, not just ANYONE who is giving you money or attention. This is the power of connection – of companionship and relationships. When you create a line between insiders, and outsiders, it polarizes things. And sure, that can be used in a negative way, but it can also be used in positive ways. 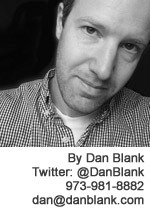 Let me know if I can help you in building your business & career: @DanBlank, 973-981-8882 or dan@danblank.com.